The Adopt-A-Trail Program provides a way for businesses and individuals to take a leadership role in trail maintenance. Our Adopt-A-Trail Program highlights your commitment to our non-profit, trail preservation and the great outdoors. Your philanthropic contribution to Lost Sierra trails will instill pride for you, your company, and your employees. And it is a great way to promote your business while demonstrating that you care for trails that current and future generations will enjoy. Sierra Buttes Trail Stewardship (SBTS) staff works with the adopting individual or organization to provide necessary trail supervision, tools and training. We will host a trail workday and party for your employees, fellow staff members and/or friends. Trail work is a rewarding team building experience! 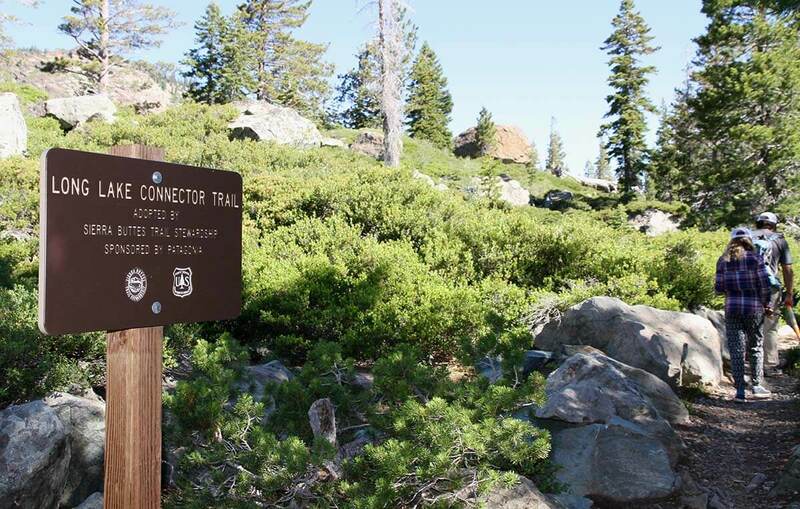 If you or your organization or company are interested in adopting a trail, take a look at the Adopt-a-Trail Programs Menu and contact Frank Gulla at frank@sierratrails.org. a multi-year contribution. These funds are used for spring log out, brushing and immediate drainage work that everyone notices and appreciates. Thanks SBTS!! You do great things for us to enjoy. Saw your work on the trail to Long Lake. Yeah! Trail Crew Adoption allows you to invest directly in local Lost Sierra employment and trail building. Our Pro Trail Crew works all season to build new trails and maintain our 800+ miles of trail. Our paid Youth High School Crew works several weeks during the summer creating employment for local youths – along with teaching them stewardship and life skills while offering a backcountry experience. If you or your organization or company are interested in adopting a trail crew, take a look at the Adopt-a-Trail Programs Menu and contact Frank Gulla at frank@sierratrails.org. Adopting a Mountain Epic or Trail Daze event directly funds the food, beverages and good times we provide to our volunteers during trail work. As a nonprofit, our volunteers are the foundation of our organization and allow us to apply for grant fund matches to accomplish significant trail maintenance and building each season. Epics include a weekend campout at one of our favorite camp- grounds, meals and tasty beverages throughout the event. Bike/ moto rides and hikes, prize drawings, Epic games and of course, a day of trail work, are all part of the experience. We host two Mountain Epics per year: one in Quincy and one in Downieville. Mountain Epics are free to all SBTS members as our way of saying thanks for their support. We average approximately 50-70 members at these events. SBTS hosts monthly Trail Daze volunteer workdays to ensure our Lost Sierra trails are holding-up and in tip-top condition. These trails see over 200,000 visitors per year and maintain a level ‘A’ standing thanks to our volunteers. It’s through these volunteer workdays that we’ve produced over 72,000 labor hours toward our trails. Our SBTS Pro Trail Crew works directly with our volunteers, teaching them trail maintenance skills and making sure everyone has fun. 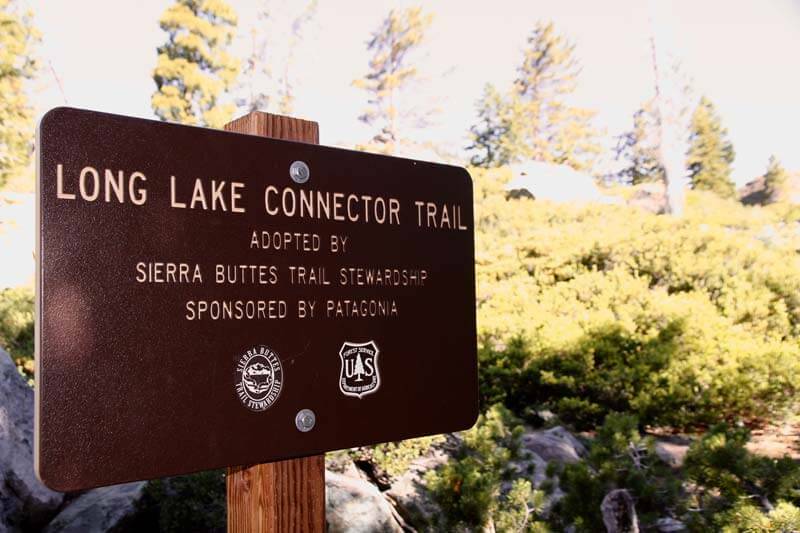 If you or your organization or company are interested in adopting a trail event, take a look at the Adopt-a-Trail Programs Menu and contact Frank Gulla at frank@sierratrails.org. Add to this that the Sierra Buttes Trail Stewardship have added new sections of trail in the high country and replaced or retreaded the trail in others and it’s a recipe for some big grins. If you are interested in adopting a trail, check out ourAdopt-a-Trail Programs Menu and contact Frank Gulla at frank@sierratrails.org.